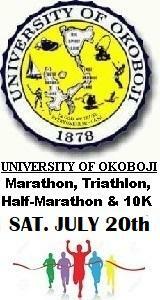 U of Okoboji Marathon, Triathlon, Half Marathon & 10K (2019) - AllSportCentral.com - Registration. Results. Relax. Got a question or comment? Talk to us, tell us what's on your mind, and we'll listen! NOTE: The Contact Event service is for participant inquiries only. Commercial inquiries or solicitation of any sort is subject to being deleted without notice. If you are interested in reaching event directors contact AllSportCentral regarding advertising opportunities. Copyright © 2000-2019 AllSportCentral.com, Inc. All rights reserved.